Dorm room storage is lacking in your college dorm room at first. However, with great dorm organizers added to your college dorm checklist, your college dorm room will be more organized and you'll have more dorm storage. A dorm essential for college is a dorm trunk to hold your seasonal clothes, extra Twin XL sheets and other dorm necessities. Here you will find DormCo's great selection of our Rhino College Trunks. 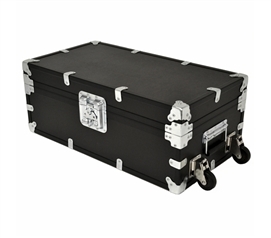 Our Rhino College Trunks are heavy duty for college and customizable - choose if you want padlocks, a nameplate, wheels and more. These dorm trunks have an armored exterior that is waterproof, scratch proof and dent proof - perfect for four years of college and beyond! Featured in O, The Oprah Magazine (September 2013 Issue, page 66) on The O List as a TOP Back to School Product! Available in 16 Colors! Lots of added features available too!! .....From Cable Locks and Laptop Safes to Trays, Engraved Nameplates and More! Available in 19 Colors! Lots of added features available too!! .....From Cable Locks and Laptop Safes to Trays, Engraved Nameplates and More! Don't go to college without a dorm trunk for extra dorm room storage! A college trunk is a great dorm organizer for extra clothes, sports equipment and college textbooks. You can even keep your college cooking dorm items in these heavy duty trunks! Our Rhino College Trunks are Made in the USA and built to last, which is ideal for four years of college. Plus when you're packing to go to college, you can pack your college supplies in this handy dorm essential and eliminate unnecessary bags and boxes!